English language study is about more than just classroom learning. English Learning Institute (ELI) orchestrates frequent cultural enrichment activities to help immerse international students in the local culture of their host country. ELI incorporates exciting events and activities to make learning fun. From weekend trips to Washington D.C. and the Great Smoky Mountains, to pottery making and oil painting classes to day trips to local museums, the cultural activities are designed to bring students out of the everyday classroom and put their English language skills to a practical test in everyday scenarios. There are no added fees to take part in these enriching activities. Students can choose up to four events per term as part of program enrollment—with the option to participate in as many as desired for a small charge. You can see some of ELI’s previous cultural activities and events below. Students and instructors spent a morning packaging almost two tons of produce donated by local farmers to the Durham Food Bank. The produce would be ready for those who need it for the upcoming holidays. Established in 1980, the Food Bank of Central & Eastern North Carolina is a nonprofit organization that has provided food for people at risk of hunger for over 35 years. The Food Bank serves a network of more than 800 partner agencies such as soup kitchens, food pantries, shelters, and programs for children and adults through 6 branches in Durham, Greenville, New Bern, Raleigh, Sandhills (Southern Pines) and Wilmington. Their volunteering was greatly appreciated. ELI students visited the Morehead Planetarium and Science Center in Chapel Hill, where they had the chance to walk through the history of science for the US. The Morehead Building houses the GSK Fulldome Theater, as well as the Science Stage, exhibits, and Morehead classrooms. The UNC Visitors Center, Morehead-Cain Foundation and UNC Morehead Observatory are also in the Morehead Building. In front of Morehead, along Franklin Street, you will find our large iconic sundial. The Morehead Building and planetarium was built as a gift from John Motley Morehead III, UNC class of 1891. Since the planetarium opened in 1949, millions of North Carolina students, teachers and families, as well as visitors from around the world, have benefited from Morehead science programs. Our most famous visitors were the U.S. astronauts in training for Mercury, Gemini and Apollo missions, including the astronauts who walked on the Moon. ELI students visited the The North Carolina Botanical Gardens in Chapel Hill, where they had the chance to enjoy a view of nature that is absolutely breathtaking. The NC Botanical Gardens have been a leader in native plant conservation and education in the Southeastern United States for more than 40 years. Students also visited the Mason Biological Reserve, which is used to support academic research education, public education and allows visitors take in the beauty of nature. ELI students visited the Rise Against Hunger Warehouse in Raleigh, which is the Global Headquarters for this organization. Rise Against Hunger, formerly known as Stop Hunger Now, which was founded in 1998, is a non-profit organization that aims to end hunger worldwide. In addition to preventing hunger, the charity responds to natural and man-made crises and also supports grassroots community empowerment. Students took a tour of the warehouse and learned about the history of the organization and goals of the organization. For the volunteering portion of the visit, students labeled 600 bags for a meal packing event. ELI students and instructors traveled to the Streets at Southpoint in Durham for the final cultural event of the winter term. Instructors tasked them with finding at least three different bargains they could find while shopping at the mall. The students found some great deals and learned new vocabulary as well as ways to use spoken English in everyday commercial life. They wrapped up their shopping trip with a meal at to the mall food court, which boasts nearly 30 different dining options and a variety of international cuisines, ranging from Mexican to Italian to Japanese, much like the mix of students at ELI. ELI students toured what was once the world’s biggest tobacco warehouse and other highlights of historic downtown Durham. They visited the Durham Museum of History’s History Hub to see displays, photographs, artifacts and presentations about the history of the area and its people. Durham was once the capital of the U.S. tobacco industry. ELI students explored the downtown American Tobacco Historic District, now home to many cafes, offices and restaurants. ELI students toured the campus of North Carolina State University (NCSU). NCSU was founded in 1887 and has nearly 35,000 students. The tour began with an information session at the Joyner Visitor Center where participants learned more about NCSU and its history. ELI students also toured NCSU’s Memorial Bell Tower and took an hour-long walking tour of the main campus including visits to Hunt Library, engineering buildings and Wolf Ridge Apartments. The tour gave ELI students an in-depth look at NCSU allowed them to explore specific places of interest. 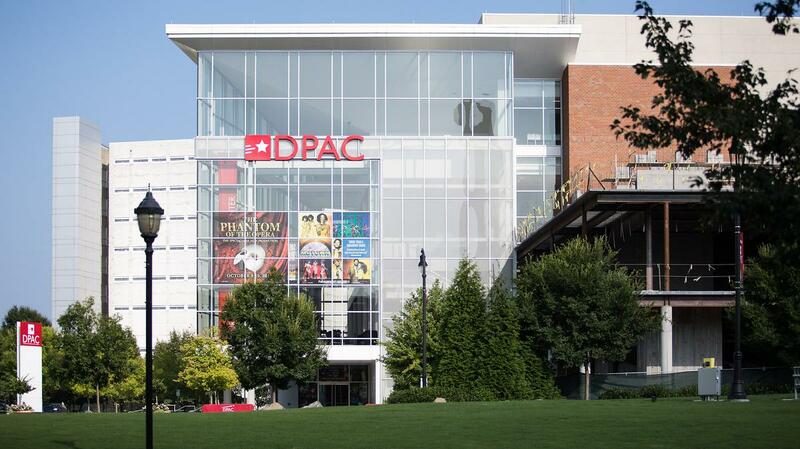 ELI students toured the Durham Performing Arts Center DPAC), the largest performing arts center in the Carolinas. Students saw the view of the stage from all levels of the theater, went through a memorable walk across the Mildred & Dillard Teer Stage, and also enjoyed city view from the BlueCross BlueShield Atrium lobby. Students also had a chance to visit backstage and explore where the stars prepare for show time. Students were given a handout that had information about what they would learn, as well as a worksheet that they completed during the event. ELI students toured the Nasher Museum of Art at Duke University to learn more about American culture and history through art. The museum currently features exhibits related to the American South. Students were guided by a knowledgeable docent who provided information and answered questions. This event allowed the students to practice their listening skills and practice verbally expressing their thoughts and ideas about art. They prepared by learning about the museum, its history and current displays. Students completed a fun worksheet during their tour. ELI students toured the downtown Raleigh Museum of History to learn about North Carolina’s rich history through exhibits, displays and videos. Students were introduced to important local historical events and figures, including the Wright Brothers, who made history in 1903 by achieving the first powered, controlled flight at Kitty Hawk, North Carolina; Mary Jane Patterson, who was born in Raleigh and became the first African-American woman in the U.S. to receive a BA degree; and Hiram Rhodes Revels, who was born in North Carolina and was the first African-American to serve in the U.S. Senate. 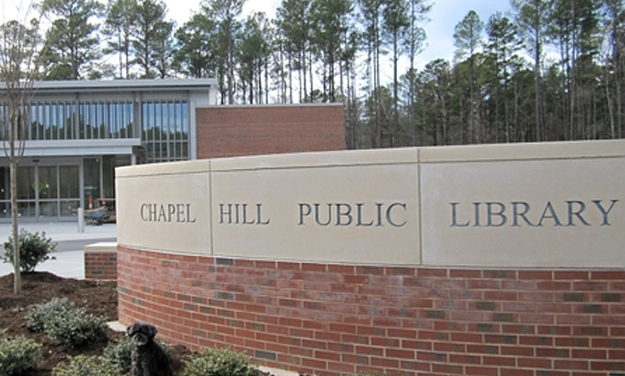 ELI students visited the Chapel Hill Public Library. The library was founded in 1958 to serve local residents and college students. The library was renovated two years ago and offers many services to residents including classes and events. A librarian guided ELI students for a tour of the facilities and provided information about the library, including its history and daily operations. Students were especially impressed with the sorting machine used to separate and sort returned books. The visiting students also learned how to use the computers to locate books, sign up for and use a library card and how to check out books they would like to read. 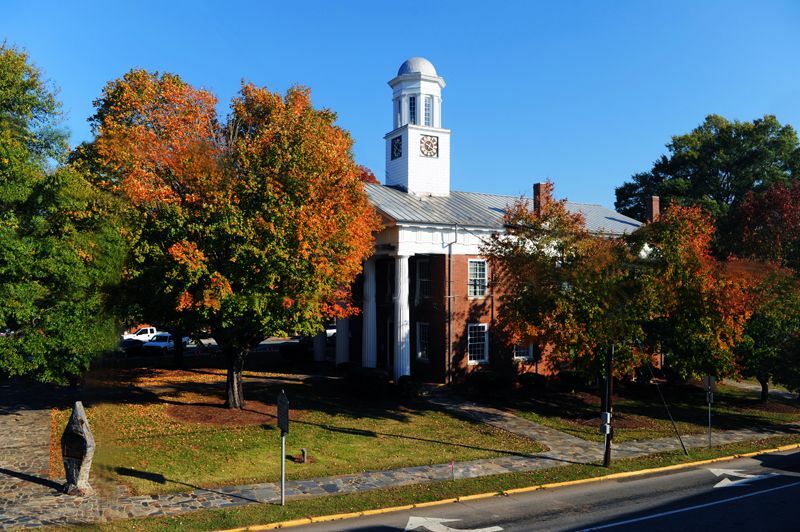 ELI students witnessed criminal trials and learned about the American legal system during a visit to the Orange County Courthouse in Hillsborough, North Carolina. Students observed two cases to learn about the legal process in a court trial and new legal terms in English. Students prepared by studying legal/courtroom terminology that they might hear during the trial. Participants later wrote about what they had learned and about the stories they had heard in the courtroom. This reading activity was held in JINLING Library, Nanjing. This reading tour started with a couple of games, and all the young learners were motivated and attracted. A read aloud story followed, and a language teacher Julia demonstrated for the students the five basic elements in a story to assist them with story comprehension techniques. After the read aloud, a group of students worked together to use their imagination to create a story poster of their own with a set of vocabulary words, crayons, paper. Finally, they ended with a presentation based on the poster they created previously. After completing this reading activity, each of them was awarded a reading passport with a special stamp on it, which means they’ve been in a world of reading.